After more than three months of weekly visits to the V-E-T for Nibbles' and Pudley's ongoing ear problems, things finally look to be clearing up! These two happy Scotties have one more visit this weekend and if they get a good report card from the V-E-T, then they get to stop these weekly trips. 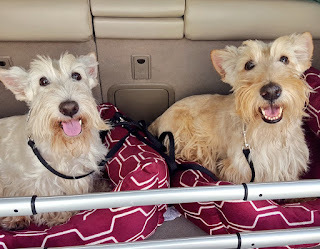 It has been a long journey to get to this point and I thought I'd share Nibbles' and Pudley's experience in the hopes we can help other Scottish Terriers resolve their ear issues. First things first: read how the ear issues started. Our first method of attack on these ear issues was a series of BNT treatments. Nibbles and Pudley were not fans of these at all and they were quite messy. However, they worked like a charm - but only temporarily. It wasn't long before we returned to the V-E-T. The V-E-T's initial thought was that their ear infections were so bad, it would take multiple BNT treatments. After the second or third unsuccessful BNT treatment, we decided to send off some of the stuff from their ears for testing. The results showed us both Nibbles and Pudley had some sort of genetic bacteria in their ears that was resistant to most medications. Hence, why the previous BNT treatments had been unsuccessful. We started Nibbles and Pudley on Clavamox chew tablets and an antibiotic. Meanwhile, we started reporting back to the V-E-T each week so they could take a close look at the ears and give them a deep cleaning each time. Nibbles and Pudley didn't care for this, either, but they tolerated it better than the BNT treatments and you could tell how badly they needed the cleaning when they came out of the V-E-T. For an hour or so after each appointment, Nibbles and Pudley would walk around shaking their heads but as the hours passed and the days followed, things returned to normal. Week after week for about as long as I've had Nibbles and Pudley, this has been our routine. I was determined to find them some relief. Fast forward to last weekend - more than three months since we first sought out to resolve my Scottish Terriers' ear issues - and the V-E-T said we've almost crossed the finish line. The ears have improved markedly. Nibbles' ears are pretty much normal and while Pudley's ears have most certainly gotten better, there is still a bit of residual bacteria remaining. We'll know more after their appointment this weekend but I can feel we're close! One thing I have found is that most ear problems in Scotties start out as bacterial, but progress to Yeast, and once you have the problem under control, make sure their diet does not include grain, sugar or starch. Hard to do, but I have cleared up many nasty ears with this. I don't know what BNT is, but another thing that works well is the warm wax pack, they melt the treated wax and put it into the ears, it runs way back down the ear canal and stays there for 2 weeks. Scotties seem to have small ear tubes and have a lot of ear problems. Thank you for taking such good care of them. Right after we got Jimmy, we moved to Arizona. We were there for 3.5 years, so he was our "Zona" dog. When we moved back to Oregon, he got hot spots which got infected, so he was on antibiotics which caused an imbalance with the ph in his ears and ended up with ear infections too. It has been difficult to deal with as he doesn't tolerate ear cleanings and we'd have to put him under in order to do this. Not only is it bad for him, but the cost was getting to be too much as $300-400 each time (about every other month). I knew it was environmental caused. He has apoquel which seems to have helped with the itching and now we have him on Respite injections. They are once a week (I'm a nurse so we can do this at home)and once we got him up to the therapeutic dose of 1ml we have not (knock on wood) had a problem since. He's got ear drops for cleaning that we do once a week as well. We haven't had to take him in for an ear cleaning or on antibiotics for over 4 months now. Our other Scottie, Mavis is 2 years older than Jimmy and she has never had any ear problems.